Every Wednesday, a new batch of comics enters this chaotic world and makes it a little more tolerable. As someone who has come to appreciate this weekly injection of personal joy, I’ve taken it upon myself to single out one particular comic that helps make that Wednesday extra special in the hearts of comic fans. This week had more going for it than most because “Magnificent Ms. Marvel #1” came out and for those still bathing in the afterglow of the “Captain Marvel” movie, this is a perfect desert. While it doesn’t feature Carol Danvers, it does focus on Kamala Khan, her biggest fan and the one who has been carrying on her mantle wonderfully since 2014. I’ve already mentioned Kamala before, having singled her out as a case study in how to do young female superheroes right in an era where gender politics and internet trolls are determined to make everything go horribly wrong. Kamala has grown a great deal over the past several years and, with the success of “Captain Marvel,” seems destined to enter the MCU. There’s so much about Kamala that makes her lovable, heroic, and compelling. 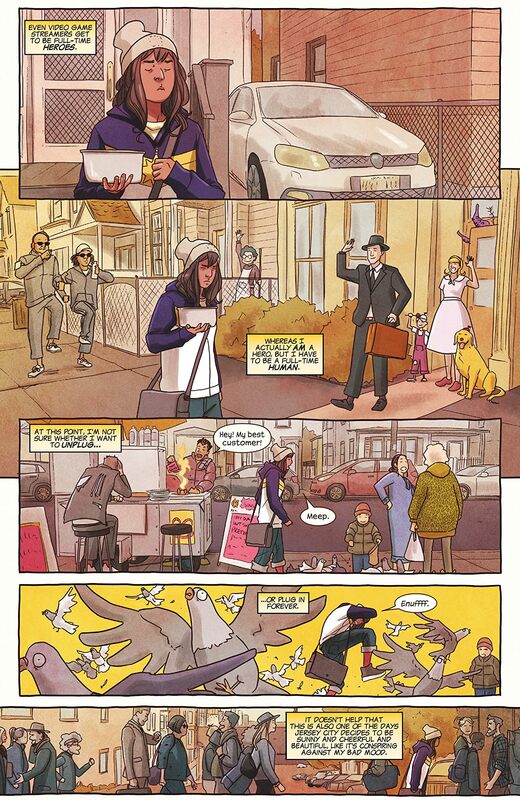 If you need a reminder why, “Magnificent Ms. Marvel #1” is the perfect refresher. This series marks a transition of sorts. 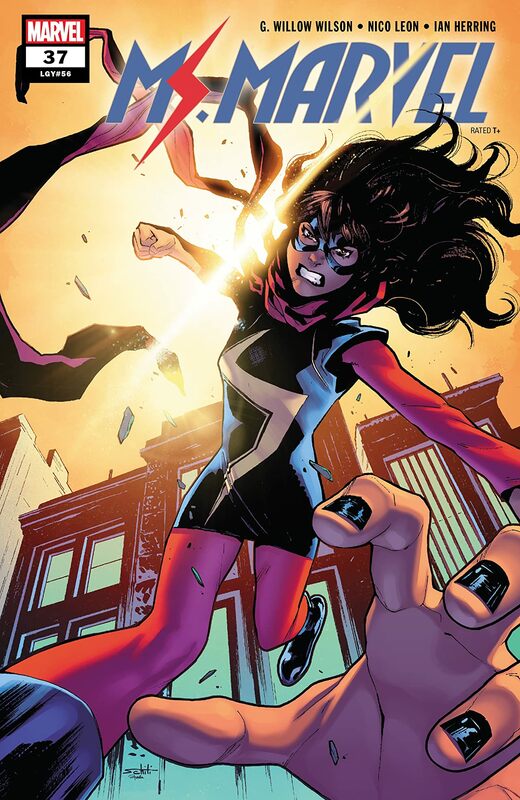 The previous writer for Ms. Marvel, G. Willow Wilson, has left the title. 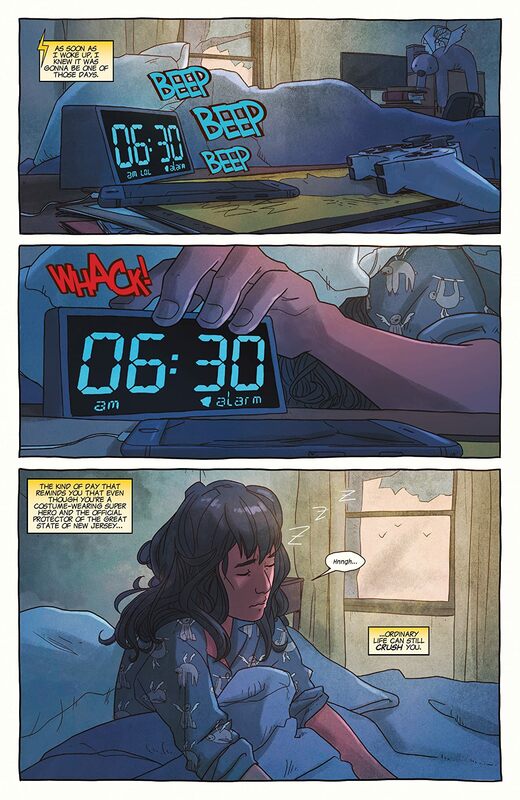 As the one who created Kamala Khan and did so much to make her so lovable, she set a very high bar. Kamala’s new writer, Saladin Ahmed, does plenty to maintain the lovability that comic fans have come to expect from Ms. Marvel. 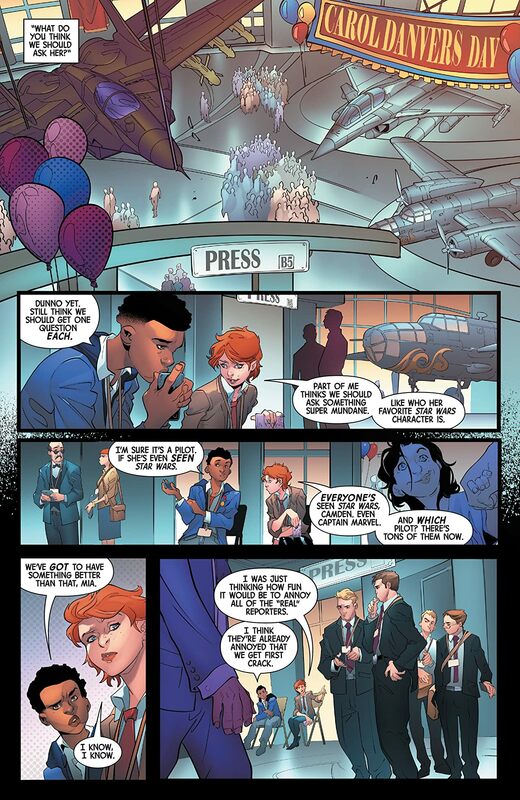 In the earliest parts of the issue, he takes a page right out of Wilson’s creative playbook by focusing heavily on Kamala’s story when she’s not in costume. It’s a major part of what makes Kamala so relatable. She’s an aspiring superhero, but she’s also a teenage girl with plenty of non-superhero issues to deal with. She has friends, parents, and bus schedules to deal with. Like a young Peter Parker, she has to balance her superhero life with her civilian life. Unlike Peter Parker, though, her life is subject to unique challenges that aren’t contingent upon dead uncles. While Kamala does spend time in her Ms. Marvel costume fighting a couple villains, the biggest upheavals in “Magnificent Ms. Marvel #1” occur when she’s not in costume. 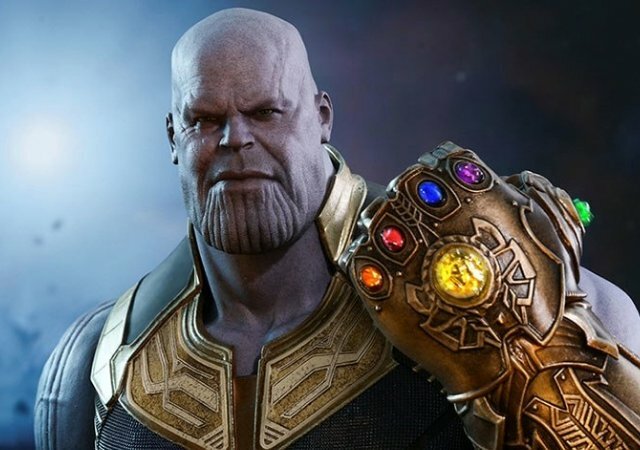 I won’t drop too many spoilers. I’ll just say that her superhero life and her civilian life come at a sudden crossroads. At first, it seems sudden. There doesn’t appear to be much of a build towards the drama. Then, Ahmed throws in an unexpected twist towards the end that completely changes the situation surrounding that drama. It suddenly becomes a mystery, one that may have greater consequences for Kamala down the road. Every teenage superhero faces critical moments, at some point, that changes the course of their journey. Peter Parker often dealt with those moments by quitting for a while, but Kamala never gives the impression that she’s going to quit. Despite all the hardship and frustration that being Ms. Marvel brings her, she never uses that as an excuse to walk away. That, in and of itself, puts her ahead of the curve for most aspiring superheroes. At the same time, it also makes her vulnerable. “Magnificent Ms. Marvel #1” puts her in a position where her life as Ms. Marvel and Kamala Khan undergo a major upheaval. She faces a new kind of threat that isn’t well-defined. However, it quickly establishes that it’s capable of attacking her on a very personal level. It’s the worst kind of attack for a young hero undergoing heavy personal dramas. She basically has to fight her battles with a wounded spirit, but she still fights. That’s what makes her Ms. Marvel. That’s what makes her so easy to root for, both as a character and as a hero. 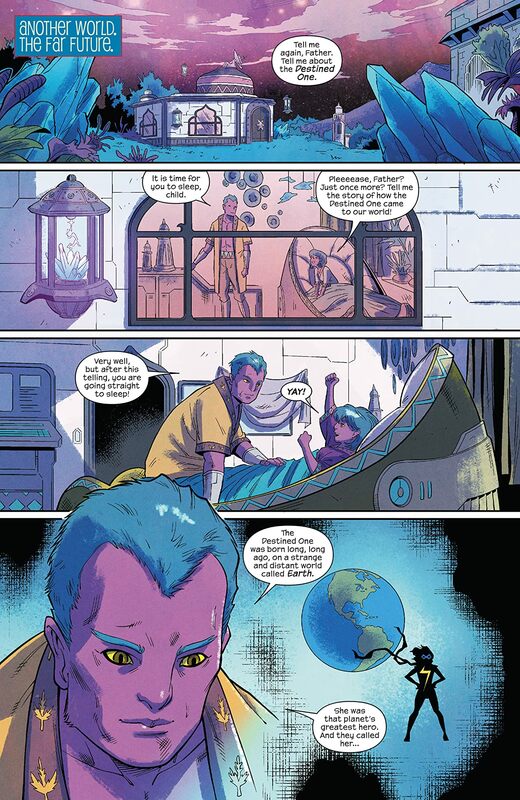 For years, G. Willow Wilson told Kamala’s story in a way that made her endearing in her own unique way. So far, Saladin Ahmed is moving that story forward in ways that make you want to root for Kamala even more. 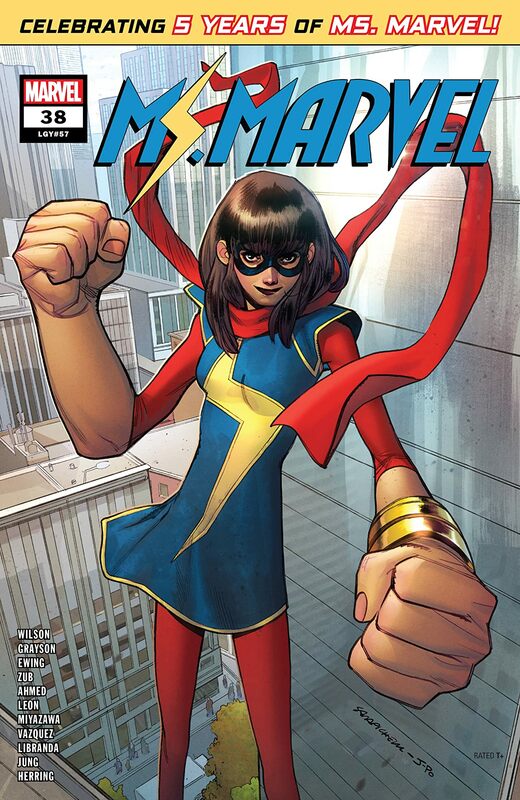 “Magnificent Ms. Marvel #1” doesn’t just tell the next phase of Ms. Marvel’s superhero journey. It raises the stakes, promising a new kind of challenge that will either break her heart or make it stronger. Every week, a new collection of comics enters this world and makes it a just little more bearable. In these times of internet trolls, political divide, and terrible movie remakes, few things are as relaxing and rewarding as enjoying a good comic on a Wednesday morning. Once again, I’m here to single out one particular comic that helps make a good morning turn into a great day. 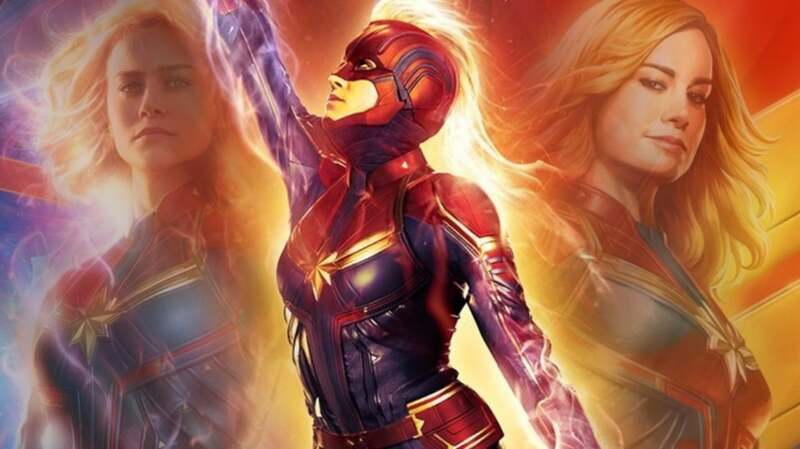 This week, along with a sizable chunk of 2019 thus far, is another great week to be a fan of all things Carol “Captain Marvel” Danvers. 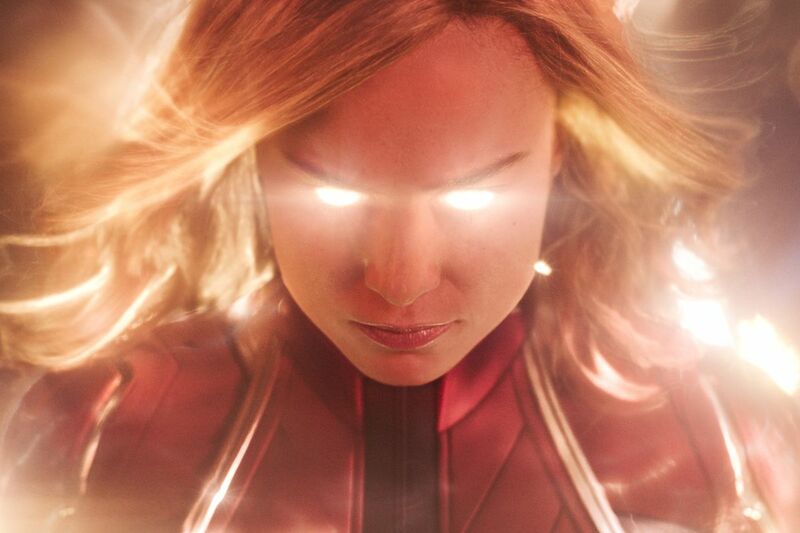 With her big debut movie coming out in just over a week, she’s about to achieve a rare status among comic book superheroes. 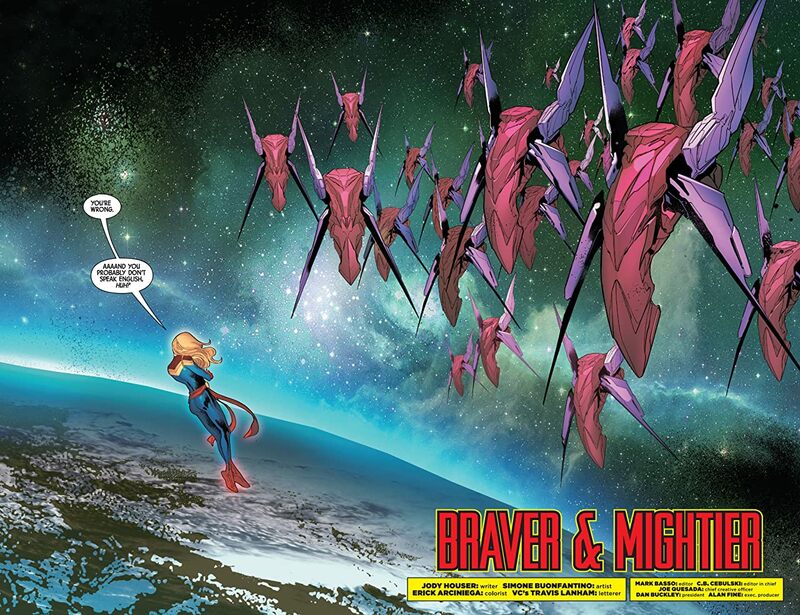 That makes a comic like “Captain Marvel: Braver and Mightier #1” that much more special. This comic isn’t actually part of Captain Marvel’s other ongoing series by Kelly Thompson, which I also highly recommend. This comic is a simple one-shot with a simple story that, in 23 short pages, highlights why Captain Marvel is a character deserving of the superhero A-list. If you’re looking for a plot with some big, elaborate twist, you’re looking for too much here and you’re looking in the wrong place. If you’re just looking for a nice, simple summation of who Carol Danvers is and why she’s such a great hero, you’ll get everything you need and then some. Writer, Jody Houser, puts Carol in a fairly simple setting. A fleet of mysterious aliens are threatening to invade Earth. It’s the sort of thing that happens at least once a week in the Marvel universe. It happens so often that it really doesn’t warrant assembling the Avengers. This sort of thing is right up Carol’s alley. While this is going on, another smaller story unfolds back on Earth. At the Air and Space Museum back on the ground, Carol is being honored with her own little day of celebration. Having come from the United States Air Force and from NASA, it makes perfect sense that they would single her out as their preferred hero. Captain America already has the 4th of July and Tony Stark has a big enough ego. As part of this celebration, some people in the press are looking for a chance to interview her. Among that press pool are a couple of local high school students who only got to attend because they’re local. They’re not exactly professional reports. They even admit that. However, they still have a chance to talk to Captain Marvel and they want to make the most of it. They won’t get to ask her many questions. In fact, they need to figure out just one. 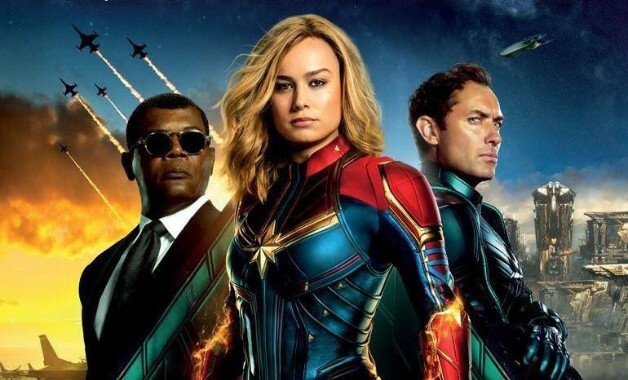 All the while, they find out along with the rest of the world that Captain Marvel is fighting aliens on the same day when she’s supposed to be celebrated. It feels exactly like the sort of thing she would do, but these two plots complement each other in a way that really works in the end. Without spoiling too much, Ms. Houser uses “Captain Marvel: Braver and Mightier #1” to demonstrate an issue that affects Captain Marvel more than most superheroes. As someone who is part human and part alien, she is often torn between worlds. Her desire to fly higher, further, and faster isn’t just about ambition. It reflects how her alien side often clashes with her human side. 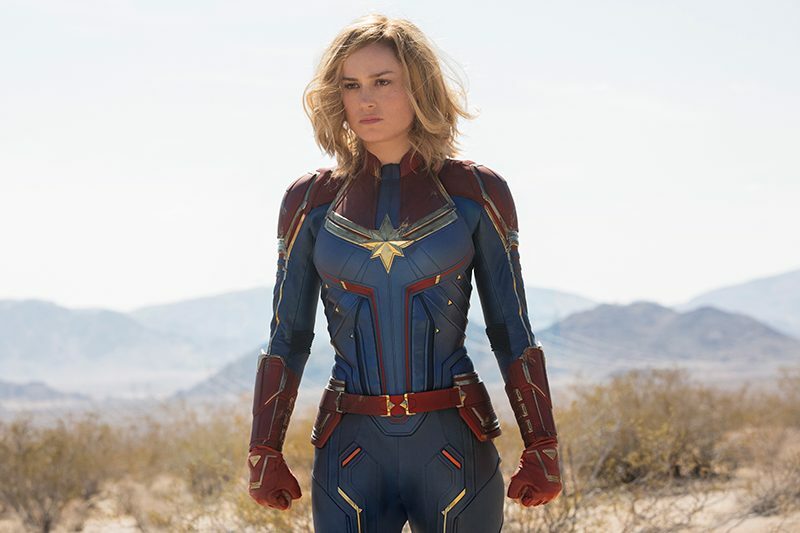 Throughout her history, especially since she took the title of Captain Marvel in 2012, she often finds herself divided between confronting alien threats in Marvel’s vast cosmic landscape and defending the Earth with her fellow Avengers. As a result, it’s sometimes hard for her to relate to the people on Earth, as well as the aliens not trying to kill her. Being able to relate to the people they’re saving is an important component for any hero, regardless of their origins or heritage. Superman is an alien and Wonder Woman is a demigod, but they still have strong connections to the world they protect. 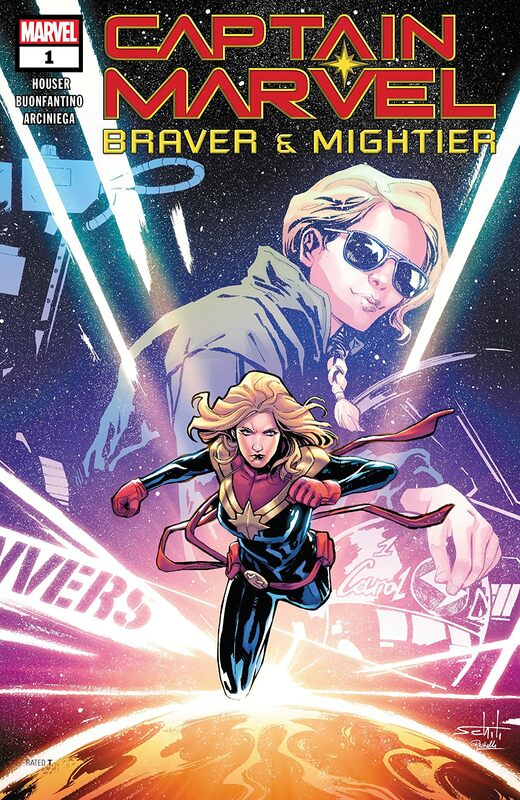 “Captain Marvel: Braver and Mightier #1” helps remind Carol of that connection. 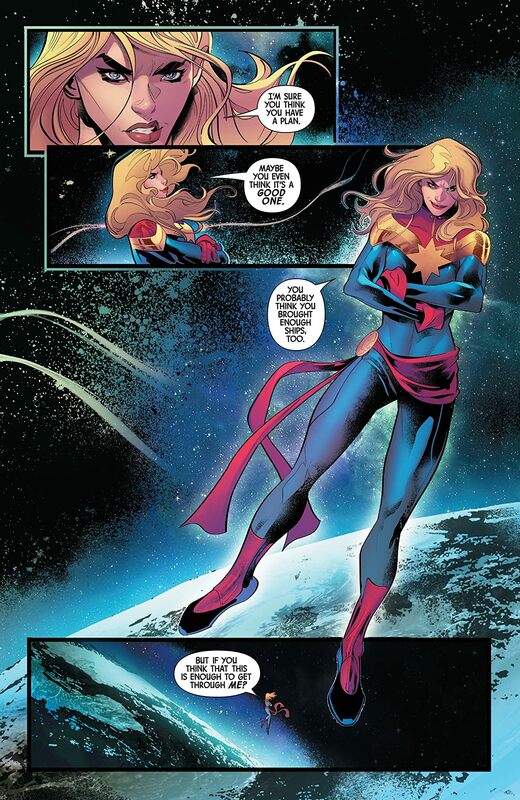 In the end, Ms. Houser’s story and Simone Buonfantino’s artwork work together perfectly to demonstrate how far Carol Danvers has come and how much further she is poised to soar. It acknowledges the challenges she faced in the past and even noted some of her failures. However, Carol takes the good with the bad. That’s not just the mindset of a good superhero. That’s the mentality of a mature, understanding person. The simplicity and humanity of “Captain Marvel: Braver and Mightier #1” makes it an excellent entry point for those curious about Captain Marvel beyond her upcoming movie. Again, it’s not too dense in terms of plot, but doesn’t need to be in order to work. It’s a good time to be a fan of all things Carol Danvers and this comic can only make those good times even greater. Fridays may be everyone else’s favorite non-weekend day of the week, but ask most comic book fans and they’ll say Wednesday holds a special place in their hearts. It’s that magical day when a new batch of comics enters the world and our souls are nourished by their awesome. I don’t care what kind of a week I’m having. When new comics come out on Wednesday, I find a reason to smile. This week, with Valentine’s Day coming up and me being single, I needed more reasons than usual. 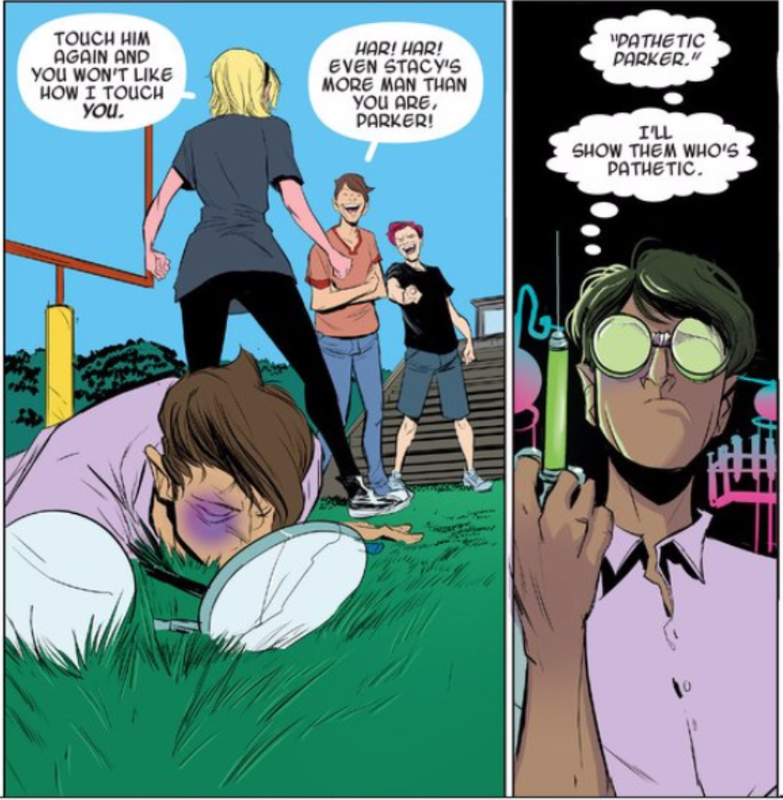 Thankfully, this week brought us Ms. Marvel #38 and I’m already feeling the love. It also happens to be the five-year anniversary since her landmark debut. Given all the awards and accolades she received in that time, this definitely qualifies as a milestone worth celebrating. 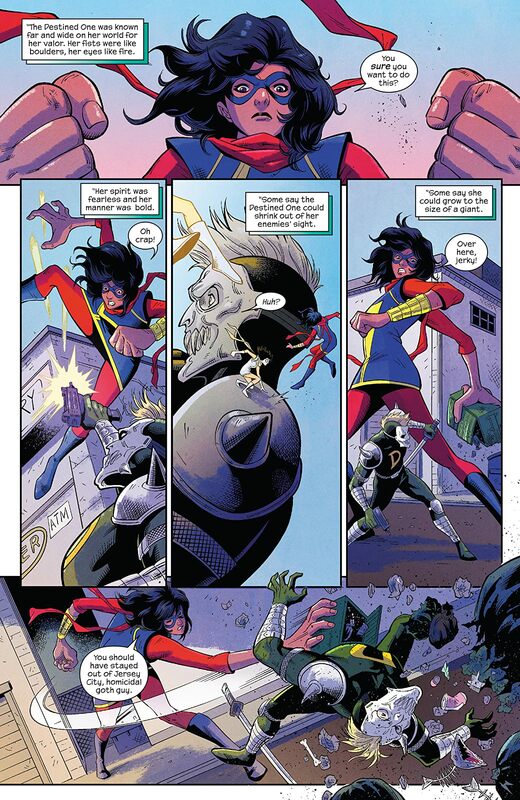 I’ve gone out of my way to praise Kamala Khan before, citing her as a prime example of how to do female superheroes right in this crazy era. She’s young, lovable, determined, and idealistic. She’s also relatable, dealing with the same problems that most stressed out teenagers from Jersey City often deal with. 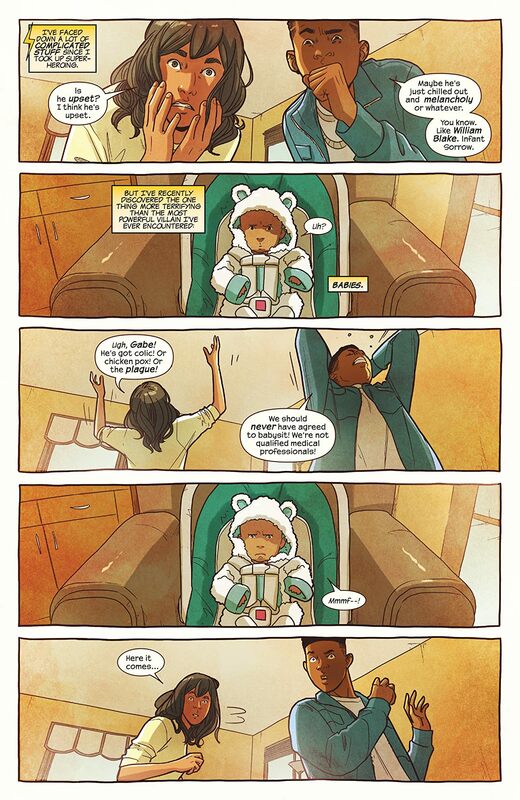 If the past five years of comics haven’t convinced you of that, then Ms. Marvel #38 should help make that point. This milestone issue is a one-shot, self-contained story that starts off with Kamala being in a miserable mood. Then, after a brief, but colorful adventure with her friends, she remembers that being pissed off all day is a waste of a perfectly good day. It’s simple. Writer G. Willow Wilson doesn’t try to reinvent Kamala here. She just affirms why she has come as far as she has in five years. A big part of that process involves highlighting the parts of Kamala’s life that don’t involve costumed villains, superpowers, and dealing with Deadpool’s dirty jokes. Wilson takes the time to show Kamala dealing with parents, siblings, and just getting to school on a day when she feels like crap. It may seem mundane, but Wilson uses it to humanize Kamala at every turn. In the same tradition of Peter Parker’s Spider-Man, Kamala Khan’s Ms. Marvel is a teenage girl first and a superhero on the side. She doesn’t have the luxury of mixing her personal life with that of her superhero life. Both affect the other and rarely in a good way. She wants to be a superhero, but she doesn’t want to stop being Kamala Khan. That’s not just a challenge. It’s overwhelming. The stress really gets to her in this Ms. Marvel #38. Even without some major villain attacking, she’s doubting herself and her ability to manage everything. Then, she finds herself plucked into a strange new dimension where the most cheesy tropes of old RPG games come to life. If it sounds random, that’s because it is, but that’s exactly why it works. Like a double shot of espresso and a slap upside the head, Kamala has to stop moping and be Ms. Marvel. At the same time, she has to help her friends who get sucked into this world as well. Nakia, Zoe, and Bruno do not have superpowers. However, they still end up helping Kamala every bit as much as her powers. It’s one of the most common, but powerful themes of Ms. Marvel comics. 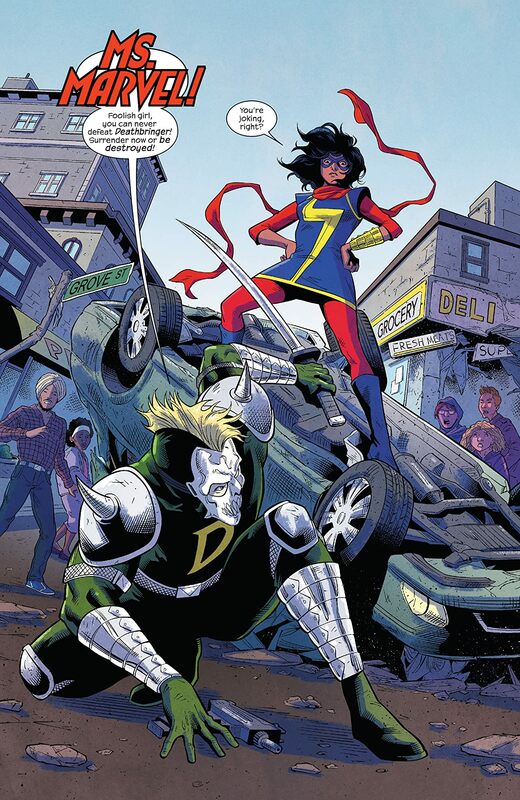 Whereas supporting characters often end up being complications and liabilities for many heroes, Kamala’s supporting cast often supplement her heroics rather than hinder them. Sure, they still have to be rescued every now and then, but it never feels like anyone is a damsel. There’s also more to this little dive into the world of overdone video game themes than just giving Kamala an adventure to go on. In between the colorful visuals that artist Nico Leon provides every step of the way, there are a few powerful moments in which Kamala and her friends realize how much they’ve grown and how much they haven’t. 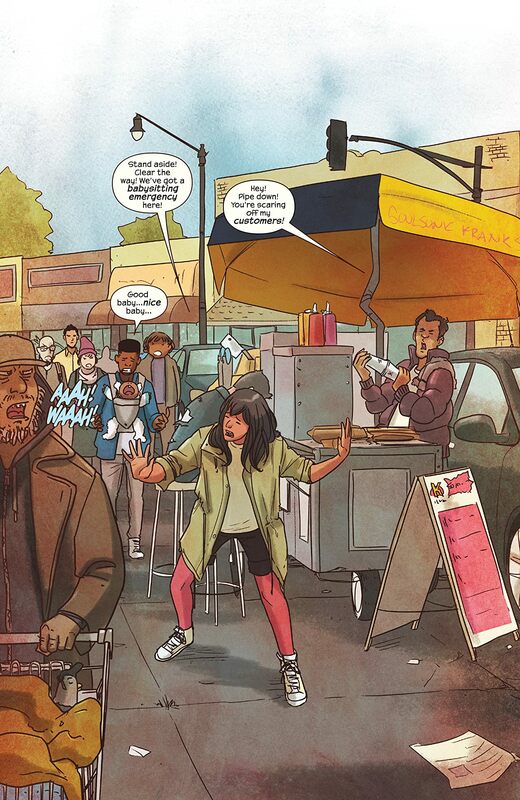 It’s a fitting testament to how far Kamala Khan has come in the past five years. On some levels, she’s the same insecure girl she was before she got her powers. On others, she’s grown a lot since then. Having watched her grow since her debut issue, I found Ms. Marvel #38 to be a satisfying testament to the kind of hero she has become. For that reason and plenty others, Ms. Marvel #38 is an easy choice for my weekly quick pick. 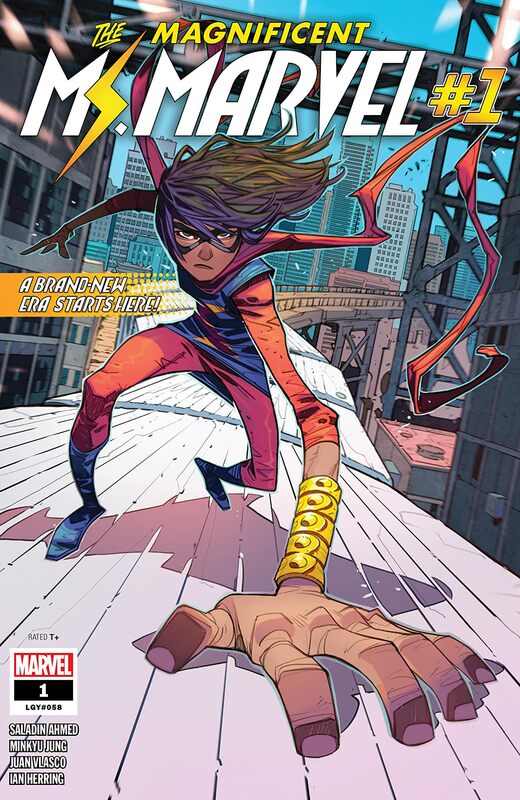 Even if you haven’t been following Kamala Khan’s story too closely at this point, this wonderfully-crafted, self-contained story will help reveal why she has become such a big deal in comics in the past five years. Hopefully, the next five years are just as enjoyable, especially if she ever finds her way into the MCU. 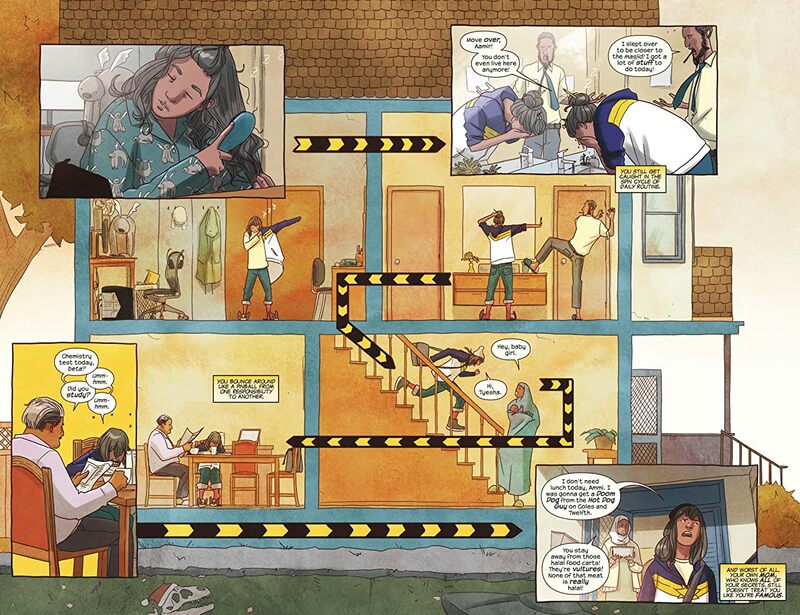 Beyond being a teenager, a girl, and a fan of superheroes and video games, Kamala Khan’s journey is one that’s easy to follow and even easier to root for. She starts off having a bad day and you can’t help but want to see her turn it around. We’ve all had bad days. Some are so bad that even superpowers can’t cheer us up. However, Ms. Marvel finds a way because she’s just that special. It’s a great time to be fan of superhero comics, but it’s especially great if you’re a Spider-Man fan. Even if you’re not a big fan of the superhero genre, it’s hard to deny the prominence of this famous Marvel franchise. Between a successful spin-off movie in “Venom,” the remarkable acclaim for “Into The Spider-Verse,” and the recent trailer for “Spider-Man: Far From Home,” it’s an amazing time for wall-crawler enthusiasts. At this point, hoping for more is just being greedy. With a sequel to “Venom” in the works and other spin-off projects in the pipeline, it almost feels wrong to hope for something specific. Marvel, Sony, and Disney are already giving us so much. What more can they possibly offer? Well, I’d like to make the case that there is one particular branch of the evolving Spider-Man universe that warrants greater attention. It’s something that was already hinted at within “Into The Spider-Verse” and I feel she could have a greater than any other Spidy-centric media. The timing is right. The market is ripe for her ascension. It’s just a matter of building on foundation that is already rich with potential. I’m referring to Spider-Woman, also known as Gwen Stacy, but best known as Spider-Gwen. In the mythos of Spider-Man, she’s a fairly recent development. However, her rise to prominence has been nothing short of spectacular and I believe she has done plenty to warrant her own place in the franchise. Most Spider-Man fans know the name, Gwen Stacy. She has had a prominent place in the Spider-Man comics for decades. However, like Miles Morales, Spider-Gwen emerged in an alternate universe where known characters are different and events unfold differently. Her sequence in “Into The Spider-Verse” offered a brief overview of who she was, but her story is far richer than that. That story still contains many of the iconic themes associated with Spider-Man. Issues like power, responsibility, and dealing with J. Jonah Jameson are a huge part of Spider-Gwen’s story. However, there are a few distinct variations that help set her apart and it’s because of those traits that I believe she can carry her own movie. What follows are just a few reasons for why I feel that way. There are probably plenty more that other Spider-Gwen fans will resent me for skipping. I understand and accept that responsibility. Since these are such great times for Spider-Man fans, I like to think we don’t need that many reasons to give someone like Spider-Gwen her own movie. If the success of “Into The Spider-Verse” taught us anything, other than the inherent appeal of cartoon pigs, it’s that you don’t have to be Peter Parker in order to embody the themes of Spider-Man. 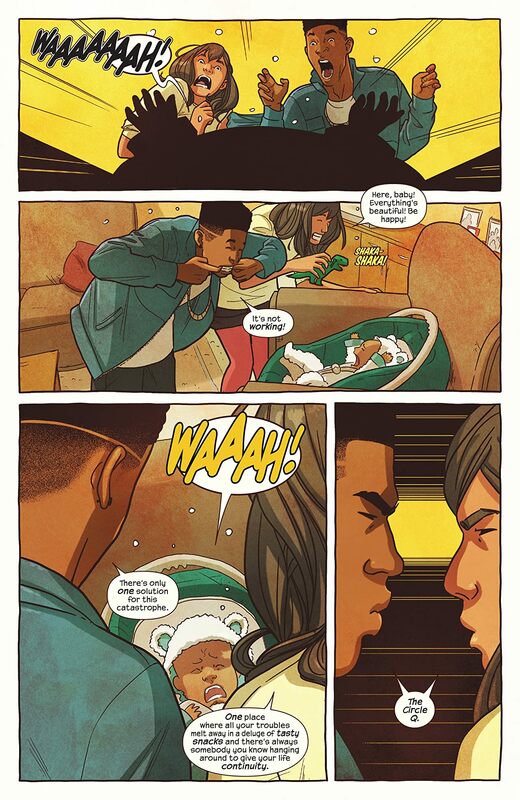 Miles Morales did a lot to set himself apart in terms of personality, circumstances, and abilities. Spider-Gwen does plenty of that too, but she takes it even further. In the world of Spider-Gwen, the story of Gwen Stacy unfolds very differently. She’s not a nerd like Peter. She’s not a biracial teen trying to fit in at a new school. She’s the same sweet girl that Spider-Man fans know from classic stories. That all changes when she gets bit by that radioactive spider instead of Peter. 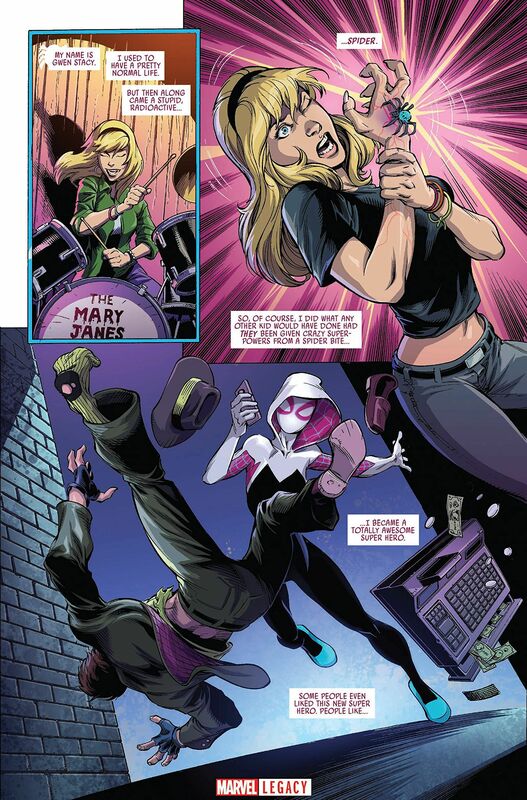 The Gwen Stacy that emerged after is still Gwen, but she goes about utilizing her powers very differently compared to Peter. They change the way she carries herself. She doesn’t approach them the same way as Peter or other Spider-Man characters. She follows her own path, complete with her own sense of power and responsibility. Her approach is not radically different from that of Peter Parker, but it still feels distinct. 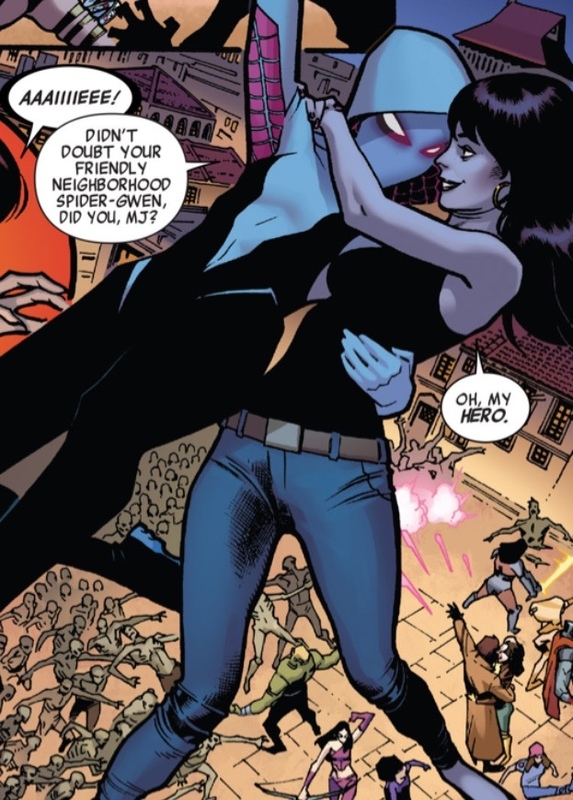 How Gwen becomes Spider-Woman and how this affects her, as a character, is not a story that can be told with Peter Parker, Miles Morales, or any other character, for that matter. The fact she’s a woman at a time when female superheroes have been subject to greater scrutiny is just a nice bonus. Moreover, the story of Peter Parker has been told and retold many times, already. 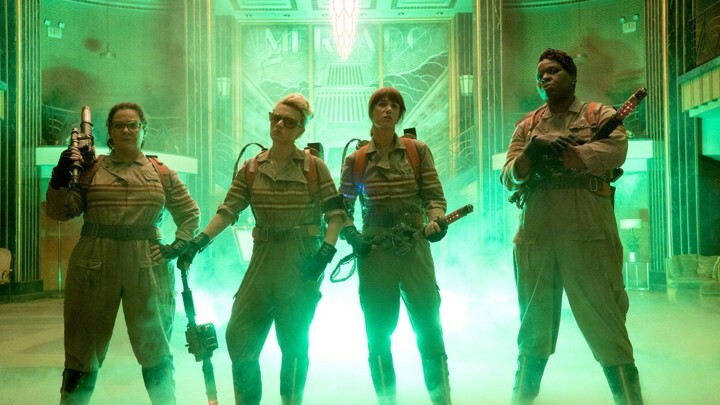 There have been three distinct timelines with three different actors taking on the role. There’s only so much more that can be done at this point. Gwen Stacy is a different story, but one that’s familiar enough to fit into the greater Spider-Man mythos. Being a masked vigilante is hard. Five decades of Spider-Man comics and three movie franchises have done plenty to establish that. However, Peter Parker never had to deal with being a vigilante while having a cop for a parent. He also never had to be the prime suspect in the death of a friend that he tried desperately to protect. Those are just some of the challenges Gwen faces throughout her story in the comics. Unlike Peter, she’s not just another high school student trying to balance her personal life with her superhero life. She faces far greater challenges than not having a date to the prom or showing up late to class. One of her biggest challenges, throughout her story, revolves around being a vigilante while her father, George Stacy, is a cop with the NYPD. On top of that, he’s initially tasked with arresting Spider-Woman because she’s implicated in the death of Peter Parker. Learning that his daughter is Spider-Woman only compounds that challenge. There’s a lot of drama in that dynamic. If you want to see how it plays out, I strongly recommend checking out the comic series written by Jason Latour. These challenges are things that you won’t find in a Spider-Man story with Peter Parker. Like her counterparts, Gwen bears many burdens and responsibilities, but having a cop for a father only makes it harder. At a time when the conduct of the police is under more scrutiny than ever, I think a Spider-Gwen movie could explore those conflicts better than most. Beyond giving Gwen different obstacles, it offers a different perspective on what it means to be a hero and how difficult it is to manage when family affairs get involved. It’s impossible to tell the story of Spider-Gwen without telling the story of Peter Parker in her world. Her version of Peter is very different in that not getting bit by that radioactive spider sent him down a darker path. His story is one of tragedy, but it’s the kind of tragedy that complements Gwen’s story and fits perfectly with the themes of Spider-Man. 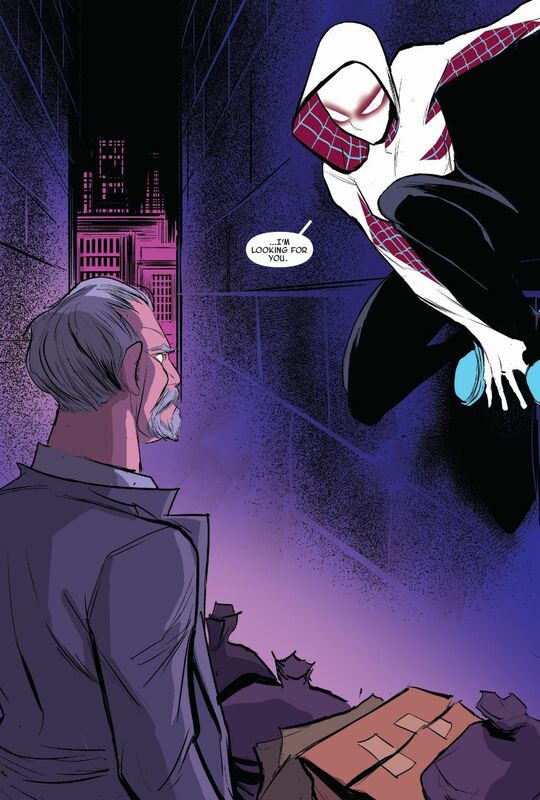 In many respects, Peter fills the role of Uncle Ben in the world of Spider-Gwen, but not in the same way. It’s not a classic case of failing to stop him from getting hurt by a random accident. Gwen actually went out of her way to protect Peter. Getting superpowers actually made that easier for her. She sees him as her friend and wants to help him. However, in doing so, Peter makes some fateful decisions that result in his death. It’s not just tragic. It’s gut-wrenching for Gwen. She has to watch this boy she cares about die because he wanted to be more like her. She’s very much responsible for what happened to him. On top of that, Spider-Woman is blamed for his death, thanks to shoddy reporting by J. Jonah Jameson. This version of Peter is powerful in how it twists the classic Spider-Man narrative without warping it entirely. By helping Peter like she did, Gwen ultimately failed him. That’s a different, but effective way to learn the importance of power and responsibility. Even in stories where she doesn’t have powers, Gwen Stacy is a genuinely likable character. She’s sweet, fun-loving, and genuine. She’s the kind of girl you can be friends with and/or fall in love with. She’s honest and blunt in how she deals with people. She’s also compassionate and understanding. Getting superpowers only enhances these traits. What we saw in “Into The Spider-Verse” was just a small sample of a much richer persona. Her attitude, as well as her ability to connect with others in awkward situations, is plenty endearing. In the comics, we see this manifest in many other ways. From the way she deals with her father to how she interacts with her band-mates in their all-female band, the Mary Janes, is likable on so many levels. I would go so far as to argue that she’s a lot more likable than Peter Parker, if only because she’s less prone to brooding and whining. Throughout the comics, she ends up in some pretty rough situations, which include being actively hunted by the NYPD and unable to go home to her father after he learns of her identity. It’s rough, but at no point does she just whine about it. As sweet as Gwen is, she also has grit. She knows how to endure a lousy situation and when the going gets tough, she finds a way to get stronger. She still messes up along the way. In fact, she messes up a lot in the comics, but she learns from her mistakes and she grows along the way. I’m not saying Peter Parker hasn’t grown over the years, but even after five decades of comics, cartoons, and movies, his growth tends to regularly stagnate. Every time he seems to move forward with his life, he takes a step back, whether it’s undoing a marriage or losing his billion-dollar company. Spider-Gwen may not have had as much time to grow and regress, but her story has been allowed to evolve in many ways since her debut. That development is full of opportunities. Even though she has only been web-swinging since 2014, she has plenty of material for a great movie. This is more a logistical issue than anything else. Peter Parker has been around since the Kennedy Administration. His story has years upon years of continuity that effectively shackle him from radical change. I’ve mentioned before how all superheroes are subject to these constraints. I’ve even argued that Spider-Man is more inept than most at dealing with them. With Spider-Gwen, however, there are far fewer constraints and many potential avenues for growth. Her story, and that of her distinct alternate universe, is in its infancy, relative to other superheroes. She hasn’t been around long enough for complications and retcons to accumulate. She can follow many different paths, both in the comics and in the movies. One of the common complaints that comic fans will levy against a movie is how closely it follows the source material. Since Peter Parker is such an icon, there’s not a lot of wiggle room. With Spider-Gwen, there isn’t much source material from which to deviate. “Into The Spider-Verse” already captured the basics. A full-fledged Spider-Gwen movie will have plenty of flexibility. There are plenty of other reasons I could list to justify Spider-Gwen getting her own movie. She’s a great character who embodies unique aspects of the greater Spider-Man mythos. Given the current state of the superhero genre, especially with respect to box office returns, I don’t think Sony, Marvel, and Disney need many to make Spider-Gwen their next success story.